Judge to FDA: Get the Pharmacy Off the Farm! Drug-free meat for all sounds like the punchline of some David Brooks’ joke about neurotic, upper-middle-class professionals. And it’s true that such meat is often exorbitantly expensive and hard to access, except at whole paycheck-like grocery stores or a farmer’s market with an affluent customer-base. But unfortunately, adding antibiotics to livestock feed – to promote rapid growth, as well as to counter-act inhumane and unsanitary farming conditions – is now common practice. And that’s a threat to human health, because when we eat antibiotic-saturated meat, those drugs are far less effective when we really need them to treat, say, pneumonia or tuberculosis. 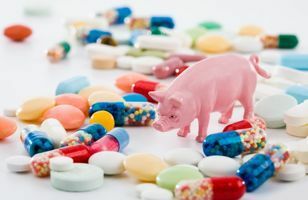 The FDA’s enforcement of current regulations restricting the use of such drugs in livestock feed has been tepid at best. Instead it has looked to the meat industry to self-regulate, with predictable results. A federal judge finally got fed up, and told the agency to stop expecting the foxes to guard the hen house. Healthy food for all: it’s shocking that something so basic has been defined as something that is either a luxury or a radical demand.